Attention golf fans! 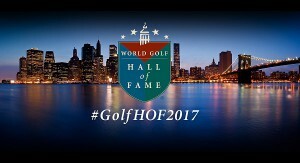 Be sure to tune in to the Golf Channel on Tuesday, September 26 to watch the World Golf Hall of Fame’s 2017 Induction Ceremony, broadcast live from Cipriani Wall Street in New York City. The event will be emceed by well-known television reporter and Golf Channel host Cara Robinson. Visit http://www.golfchannel.com for viewing information. The ceremony runs in conjunction with the Presidents Cup, which will be played next week at Liberty National Golf Club. Henry Longhurst (1909-1978): Henry Longhurst was a British golf writer and commentator. For more than four decades, he served as golf correspondent for the UK’s The Sunday Times. Among his many golf quotes, Henry is noted as saying, “Playing golf is like learning a foreign language.” So true! Davis Love III (1964- ): One of the most recognizable names in the game, Davis Love III is a U.S. golfer with 21 PGA Tour wins including one major championship. Among those wins was The Players Championship in Sawgrass (in 1992 and again in 2003). Fun fact: Davis hit the second-longest drive ever officially recorded in competition play (476 yards, Mercedes Championships, 2004). Meg Mallon (1963- ): American golfer Meg Mallon won 18 LPGA Tour events in her career, including four major championships. In 2003, she became the first player in LPGA history to shoot a 60 (just one stroke behind Annika Sörenstam’s 2001 all-time record of 59). Meg is also tied for second in the LPGA’s all-time records for most career aces. Lorena Ochoa (1981- ): At just 35, Mexican golfer Lorena Ochoa is the youngest of this year’s inductees. During her LPGA career, she was the top ranked female golfer in the world for a record-setting 158 consecutive weeks. That’s not all for Lorena’s records; she also holds the most consecutive cuts made (17) and longest streak of top 10 finishes (7). Ian “Woosie” Woosnam (1958- ): Ian Woosnam is a Welch golfer. He was a member of eight consecutive European Ryder Cup teams (1983 to 1997), and won the 1991 Masters Tournament. He was honored as European Player of the Year in 1987 and 1990, and earned the prestigious title of Officer of the Order of the British Empire in 2007 in recognition of his contributions to the game. Learn more about these golf greats at the World Golf Hall of Fame & Museum located in the heart of World Golf Village. Visit www.worldgolfhalloffame.org for more information.